I know I shouldn’t be driving under the influence. I never have before. I waited for as long as I could in order to feel a little bit more sober, and then I went. I was starving and I had way too much wine. I had to get something in my stomach and I was not going to eat in front of him. He makes faces at me. Fat people shouldn’t eat…don’t you know? He had made some kind of salad for dinner. Offered me some. I was not interested. The last thing I want to do is eat anything in front of him. So, when my hunger became too much I headed out. 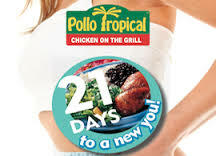 I went to Pollo Tropical. I never go there, but I didn’t want to end up at the Burger King or Wendys. I ordered a Tropi Chop and a small Ceasar salad. When I went up to pay I was so out of it that I just handed the girl my card, she swiped it, and gave it back. That’s when we realized that she had put in the order wrong. She put me in for a whole chicken with a salad. On top of that their machine was broken. So, she couldn’t give me a receipt or reverse the transaction. “I’m so sorry. Let me get you that Tropi Chop. No extra cost,” she said all flustered. I ate my Tropi Chop and contemplated what had just happened. That silly whole chicken gave me an idea…something to look forward to. I was thinking…maybe I can divide that family meal into four and pack it for work. I work 9am to 9pm and always end up eating junk. Maybe this is one way in which I can begin to create change to lose weight. Then my friend Hermann text me. He said that maybe I can change the way in which I communicate with my aunt – to get my daughter back. He said I could kind of qualify for whatever they felt was wrong. I would have to swallow my pride, but I guess it is better than being buried with it. That little chicken……………..maybe it wasn’t a wrong order after all.